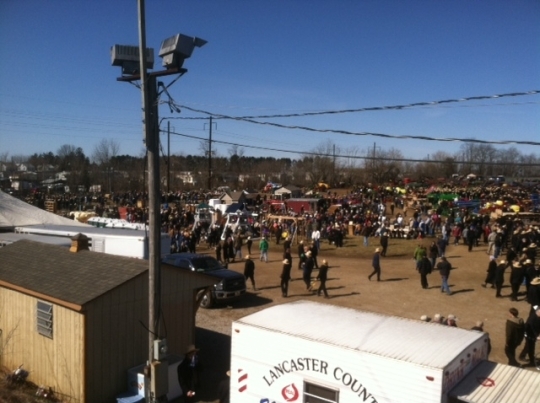 We had a look at the Lancaster County Mud Sales yesterday. 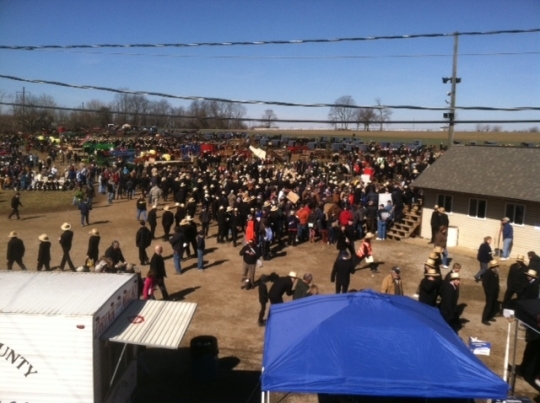 Today, Terry Berger shares a few photos from one that happened just a week-and-a-half ago, at Gordonville. End of the day buggy jam up on Route 340. Wonderful pictures! Thanks for sharing, Terry! Great pictures. I really like the last one alot. it would look good framed and on my office wall. Thanks for sharing. Thank you for sharing. I really enjoyed them. The photo above the “End of the day jam up on Route 340” picture description caught my attention. 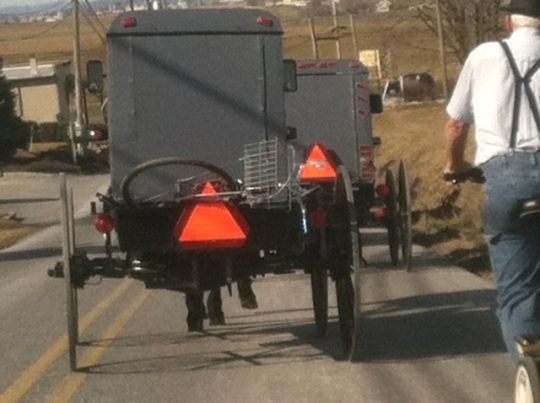 I wonder, is that a buggy for a rather large Amish Family, sort of an Amish SUV, or a tour buggy for the English? 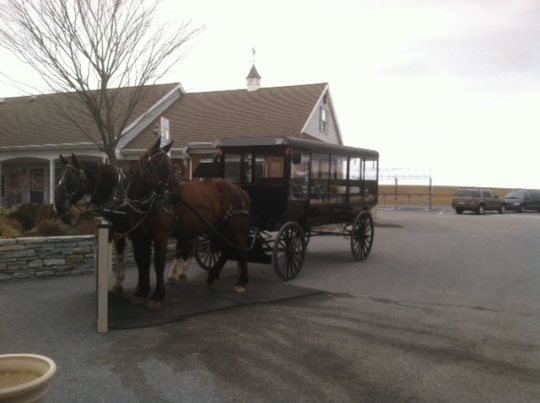 It looks like a tour buggy to me Shom…not something an Amish family would use with the super-long length and glass siding. Sweet.. enjoy the photos, always. Andy excellent to hear from you, I’ve been enjoying the photos you’ve shared on Facebook of your workers in various places. If you’d ever like to do a guest post or share some of those here, let me know (ewesner@gmail.com). Sorry I didn’t see these yesterday! Some of the shots are clearly taken from above the crowd…where might that have been, Terry? To see shirtsleeves in March (even a week and a half ago) is refreshing. It’s been bitterly cold (zero range) the past couple of nights here, and only in the mid-20’s during the day! Contrast that with LAST March, when it was in the 80’s here! Come to think of it, there seems to be a lack of mud at that sale! 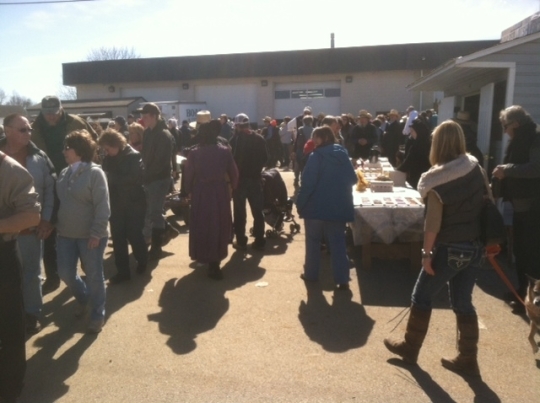 (I could handle THAT kind of “mud sale”!) 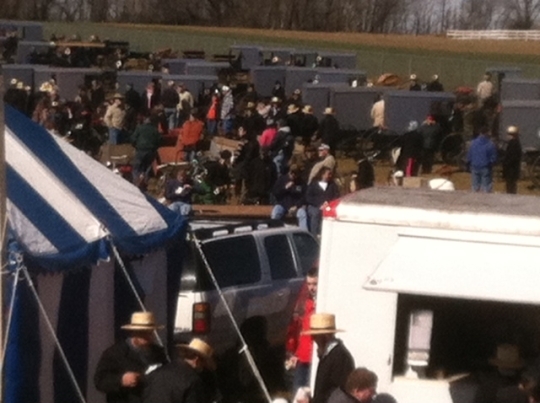 What was the biggest draw that day (besides balmy temps and lack of mud)? Thanks for sharing and posting this. 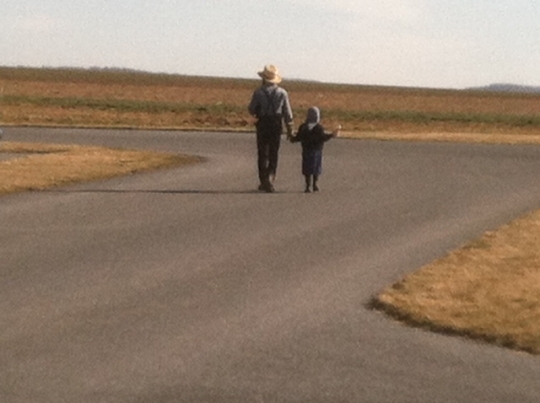 I enjoyed the Tour Bus wagon and the last photo with what looks to be a father and daughter walking down the paved road. As another has said, it would make a great print for someone’s wall.